At some point, you are going to need to call on a professional for your Dennis roof cleaning and pressure washing service needs. Too many home and business owners end up neglecting to take care of this and don't realize the damage it is causing. Having a clean roof is about more than just enhancing the curb appeal of your residential or commercial property. 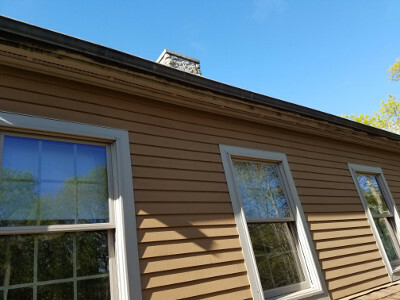 The “dirt” you see as black streaks on your rooftop, those are living organisms and they thrive on the organic material contained in your shingles. Your roof is not just shoddy looking, it is literally being eaten into a state of destruction. Call on the pros here at A to Z Softwash in order to prevent the need to prematurely replace your roof when you could just have it cleaned. Don't think this is really “that” serious? Then you may be in for a surprise when your homeowners insurance provider sends you notification that they are canceling your policy unless you get your roof cleaned. These companies have realized that cleaning is a preventative step towards avoiding premature replacement. Your dirty roof can also make your home less energy efficient. The reason that this is important is that it means your utility bills will be much higher. Plus, your home will not be “green” or eco-friendly. If you want to make a good first impression, you must have a clean roof. It doesn't matter if it is your home or your business, you want to be able to make a good impression. In fact, for commercial clients, this could be the difference between gaining new business or losing it to the competition. You may not have even heard of softwashing before and that is alright. All you really need to know is that this process is much gentler than power washing yet still as effective. This is a cleaning process that utilizes cleaning agents and not just high speed water to get the job done. Protect delicate aspects of your home by letting us clean the softwash way. A to Z Softwash will also be there to provide you with the exterior window cleaning service that you need. While many companies can't be bothered with this cleaning service, it happens to be one of our areas of expertise. Give us a call today and let us provide you with any type of softwashing or pressure washing in Dennis, MA that you may need. If you are looking for a reliable Dennis roof cleaning or pressure washing professional then please call 508-209-7795 or complete our online request form.